A real-time strategy game by Games Distillery. The game features the legendary King Arthur and his companions, the Knights of the Round Table. The King has to face a new threat — the Saxons, allied with Morgan and Mordred, who want to take over Camelot. Citadels for PC is a real-time strategy game with Arthurian themes. The production was created by Slovakian studio Games Distillery, known for Naval Warfare (also known as Aqua). Citadels is set in the early Britain ruled by King Arthur, accompanied by his loyal Knights of the Round Table. The King has to face a new threat—his sworn enemies, Morgan and Mordred allied themselves with the Saxons to gather a great army and take over Camelot. The result of this conflict depends only on you strategy skills. Citadels tells the story of King Arthur in a new way. You can play as both the forces of Camelot and the army of evil. Each side has their own story campaign, showing similar events from different points of view. The gameplay focuses on constructing and defending castles, managing your resources, and leading your army. The battles may involve legendary characters, which can be unlocked after completing certain tasks. 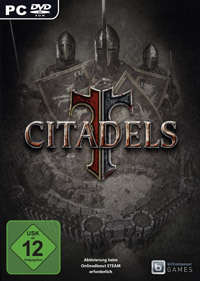 Although Citadels centers on two singleplayer campaigns, there are also other game modes. One of them is the sandbox mode, which allows you to freely build your own fortresses. For those who'd like something more intense, there is also an online multiplayer mode, in which you can also cooperate with other players to fight AI-controlled enemies. Game score 5.9 / 10 calculated out of 108 players' votes. Expectations before the premiere: 8.5 / 10 calculated out of 22 players' votes.